Kemp On Keepin' On | American McCarver. Your Sports Blog. The start of a new year is a time for reassessing, for correcting, for righting old wrongs; a time to do what you should have done in the first place. A time, say, for the stupid bastards at the Baseball Writers Association of America to fix the goddamned mess they’ve made. A time to give Matt Kemp the National League MVP for last season. 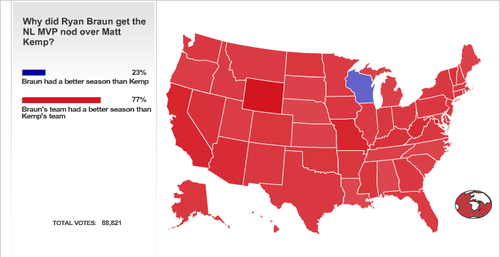 There are lots of reasons that Kemp should have gotten the award, not least of all because he earned it. Even a drooling simpleton with an Internet connection — say, a BBWAA voting member — can see that. 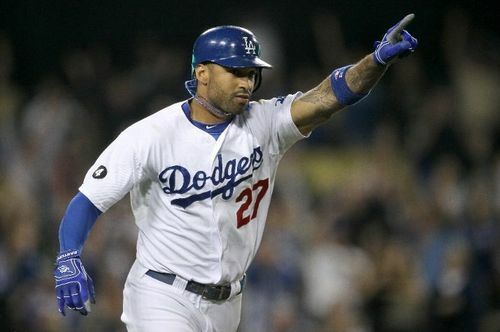 Kemp was 0.018 behind ostensible winner Ryan Braun in batting average, but ahead in stolen bases, home runs and RBIs. Also in total bases, total runs, total hits, and on-base-percentage. Also in tapping Rihanna. In other words, in all the important categories. If your decision-making methodology prevents you from counting past the number of fingers you have — this is for you, BBWAA members — let me do it for you: Matt Kemp was the player in the National League responsible for more scoring than anybody else — number one in runs, number one in runs-batted-in. Runs, it turns out, are handy in baseball, and a player who can provide them is considered “valuable.” Oh, look, who was second in both those categories? The guy who got the “most valuable” award. But wait: the Dodgers had already gotten a BBWAA award, the Cy Young for Clayton Kershaw. You can’t give both to a single team! Major League Baseball is all about making sure everybody feels good about themselves, like a kindergarden self-esteem exercise or the BBWAA bathroom, and just because one team has the two best players in the National League can’t possibly mean that they should get both awards. Just ask Justin Verlander. And so once again, the administration of baseball — the management of what happens off the field — proves itself to be shallow and small and stupid. How good Clayton Kershaw is and who the Dodgers have in their division has nothing to do with Matt Kemp or his performance. He was the most valuable player in the NL last season, hands down, and any simpering chimp at a keyboard can see that. That this article exists is proof. And all this — the stats, the other awards, the misunderstanding of what the words “most valuable” mean, the lost game — all of it ignores the lumbering, steroidal elephant in the room. Not that this upsets the BBWAA at all. Oh, no. They don’t make mistakes. Or at least they don’t undo them. “The voters used the information they had at the time of the election. I don’t see how we can change that,” said the BBWAA awards administrator, suddenly becoming Reggie Bush’s best friend. Which leaves Ryan Braun in the company of “MVP”s like noted scumbag Alex Rodriguez — people whose most valuable skill is cheating. Enjoy your asterisk, Ryan! You should use those first fifty games of 2012 to rest up, since you’re going to have to work really hard to make up your stats in the next 112. Matt Kemp was the most valuable player in the National League last year, if not the Most Valuable Player. He’s going to have to settle for that title this season, after another year of profoundly good baseball. All 162 games of it. Fun fact: Buying a bankrupt team is how Bud Selig got into baseball. Go ahead — just try to tell me that Chapter 11 isn’t an institution-destroying disaster. Thomas Knauss, the author’s sports-stat obsessed 12-year-old son, contributed greatly to this article, both analytically and in his sense of righteous outrage. Aw, it’s sweet, he’s just now realizing that the “real” baseball awards don’t usually go to the best players in either league due to people not understanding modern stats. FWIW, the nerds at Baseball Prospectus agree with you. This is owing to a bunch of stats you didn’t mention. Kemp led the NL in OPS+ (171) and had the highest Wins Above Replacement Player of any player since 2004.